Republican National Committee Chairman Michael Steele is planning on spending $1 million in ads against Democrats across some three dozen states to beat back the push to overhaul the health care system. The Republican National Committee is putting its money where its mouth is. It announced this week that it will spend (cue -- appropriately -- the "Dr. Evil" voice) one-million dollars in advertising to battle Democrats health-care plans. That's a significant amount for a party to dole out during a non-election year -- especially one coming off a demoralizing defeat. But, in the big picture, it makes a lot of sense. For one, the party can afford it: The RNC is clobbering its Democratic counterpart in fundraising, having raised nearly $9 million more than the DNC during the first half of the year. Given the vaunted power of the Obama campaign, that is a pleasant surprise to the GOP. More significantly are the strategic political problems the Democrats are facing over health care. Public support for a health-care overhaul has been dropping over the last several weeks. President Obama's planned deadline of the August recess will not be met. Democrats are divided -- both between the House and the Senate and ideologically within the two chambers. Even with technically 60 members, Democratic senators admit that they can't get a bill passed with only their votes. They need Republicans. Which is why it makes perfect sense for the GOP to strike now. With Congress preparing to go on recess within the next week, the RNC ads can run in as many as 36 states for a month. House Democrats and their constituents in various swing districts will get to hear the GOP message which will be straight and to the point: "If you're happy with your current health insurance, you sure don't want what the president and the Democrats are offering. If you're not so happy with the current system, well, you won't want the alternative either. It's worse." Something like that anyway. 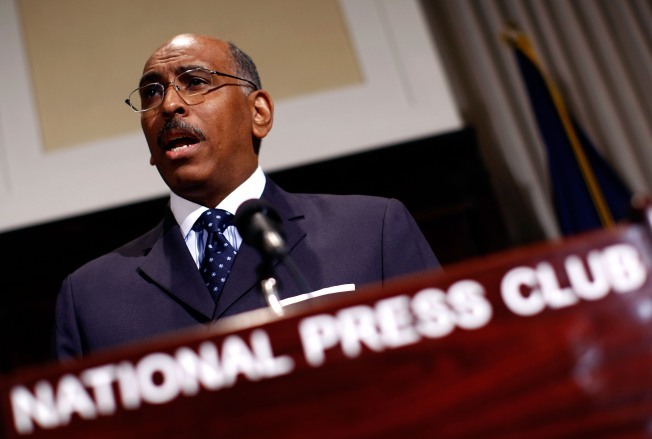 RNC Chairman Michael Steele's million-dollar bet is actually a smart one. Aside from taking advantage of the Democratic disorganization, derailing a national health insurance program is in the long-term best interests of GOP. A new entitlement would put the Republican Party on the defense for decades -- just as Social Security and Medicare have in the past. While Republicans do honestly believe that a de facto government takeover of health-care is bad policy; they also realize that it is awful for them as a party. So, the best insurance for their party's good health -- is strangling health-care "reform" in the cradle.